Thérèse Bonney. Paris, France, 1925-30. 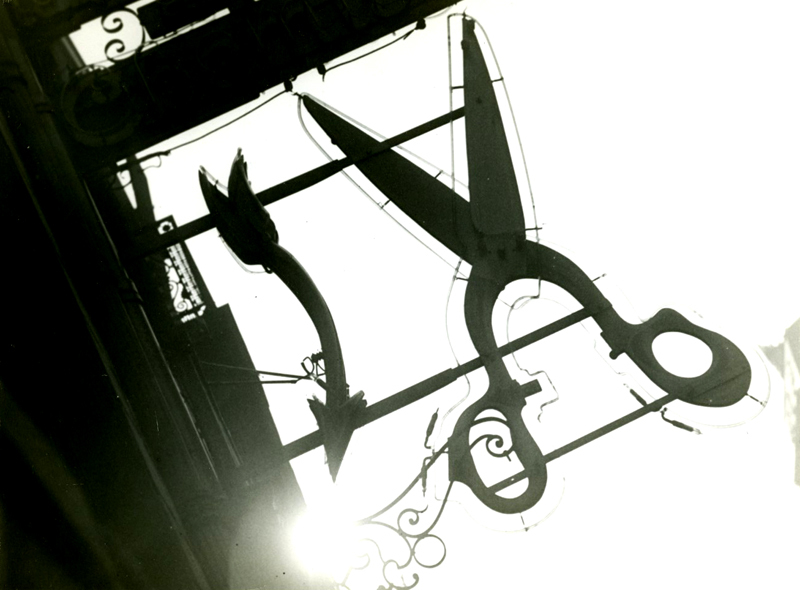 Scissor shop sign, denoting the business of a seamstress or tailor. Born in upstate New York, Thérèse Bonney(1897-1978), was a photojournalist whose work reflected a wide variety of interests and subjects. She studied at the University of California at Berkeley and Radcliffe College in the 1910s. Bonney immigrated to France in 1919 where she became one of the first ten women to graduate from the Sorbonne and founded the first American illustrated press service in Europe, the Bonney Service, in 1924. In Woody Allen’s latest film Midnight in Paris, a modern-day writer finds himself repeatedly traveling back in time to Paris at the height of the 1920’s. While there he meets a number of the period’s famous writers and artists, from Ernest Hemingway and Gertrude Stein to Salvador Dali and Pablo Picasso. Seeing this film made me want to learn more about the fascinating lives of these people, so I decided to research Scott and Zelda Fitzgerald, who in the film introduce us to the world of Paris in the twenties.